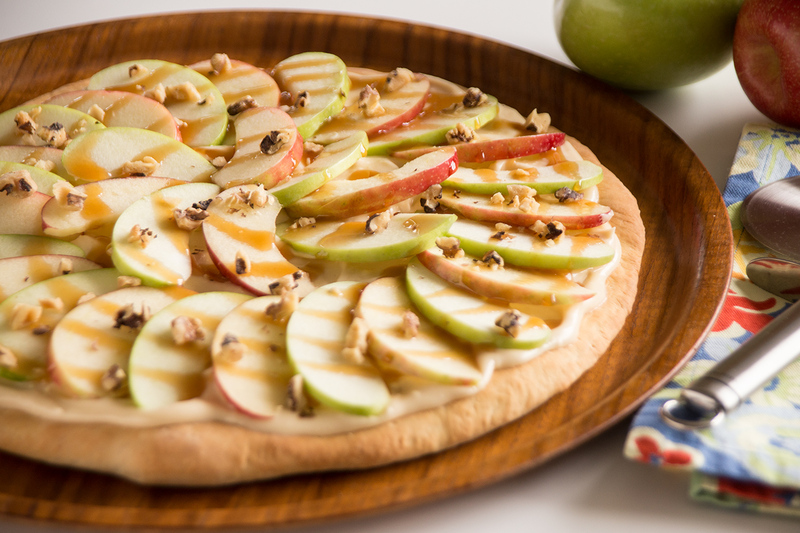 This delicious sweet pizza is the perfect combination of sweet and tangy with the wonderful apple slices. Spray counter lightly with non-stick cooking spray. Combine rolls and roll into a 14 inch circle. Cover with plastic wrap and let rest 15-20 minutes. Remove wrap and place dough on a sprayed 12 inch pizza pan. Poke with a fork several times to prevent bubbles from forming. Bake at 350 degrees F 12-15 minutes or until nicely browned. Remove from oven and let cool completely. Soak apple slices in pineapple juice to prevent browning then place on paper towels to dry. Combine butter and cream cheese and mix well. Add powdered sugar, 1/4 cup caramel topping and vanilla. Mix until smooth.